CU BEAR, BIGGEST, WE LOVE YOU! After many years of reading about Irish Wolfhounds, admiring them, and ogling various dogs at the North Texas Irish Festival, Butterfly and Gryphon applied to adopt a wolfhound from North Texas Irish Wolfhound Rescue in 2002. Not quite a year later, at the 2003 Irish Festival, Butterfly found out that the group had a prospect for her. 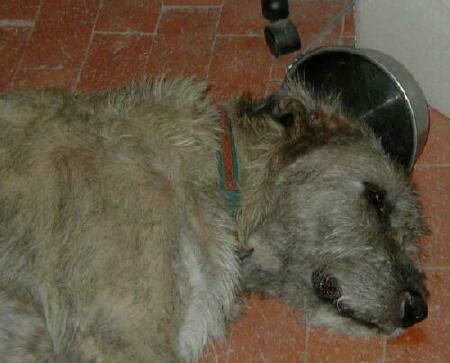 Cu was considered a special needs dog due to his age (at 5, he was considered a senior in wolfhound terms) and background. After growing up in a family, Cu's recent history was turbulent with a loss in the family and inability of the surviving family member to care for such a big dog. Butterfly went to meet him the next day, and fell in love on sight. Cu lived to the ripe old age of 12 and had many adventures. We still miss his woebegone face and his Irish tenor. In March of 2003, we loaded Lionel, Rowdy, and the parrots into our ancient RV and headed for Dallas, Texas, where Gryphon would meet the new boy and, if all went well, we'd sign the papers and bring him home. Nobody was surprised when the deal went through - Cu and Gryphon liked each other, so home we came. 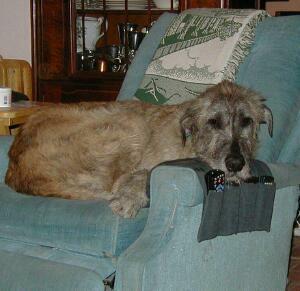 Cu discovered on arrival in New Mexico that our LazZBoy recliner fit him nicely. "Cu" is Gaelic for "hound," and while it's not an original name it is the one he knew and he'd been through so much change by the time he came to us we decided he didn't need to learn a new name as well. Cu was a major food hound, and would steal and eat anything he could find. Below is a picture taken immediately after a binge in which he removed an economy-sized jar of Tums from a desk drawer, carefully unscrewed the lid, and ate all 400+ Tums inside.